2016 is done. Finished. Stuff happened, some good, some bad. Forget about it, 2017 is here full of optimism, enthusiasm and packed to the eye balls with awesome biking moments. Below are the things we're looking forward to most. There are few names as synonymous with superbike glory as Honda Fireblade, but recent incarnations of the Fireblade have been a little damp, and they've been left behind the bigger boys with more power and fancier electronics. That's all about to change. The Fireblade is back with a bang for 2017 and it's not holding any punches. In fact we'll be getting three new Fireblades. The new standard Fireblade weighs 196kg and makes 189bhp, which is controlled via nine-stage traction control and three rider modes. Move up a notch and we have the Fireblade SP. It's lighter than the standard 'Blade and uses parts from Ohlins and Brembo. But Honda can do even better. And they did, with the Fireblade SP2. Take the SP, add lightweight Marchesini wheels and engine technology derived from the RC213V and what you have a is a limited-to-500 homologation special. Tasty. Our Head of Content Tim Thompson reckons it'll be the best bike of 2017 and we don't have long to find out - Senior Road Tester Adam Child was the lucky one who attended the launch recently, and he reckons it's rather good. Three-time MotoGP champion Jorge Lorenzo has left Yamaha after nine years to join Italian manufacturer Ducati, in the hopes he can do what Valentino Rossi could not and secure a first Ducati championship since Casey Stoner in 2007. Replacing him in the factory Yamaha squad is fast young rookie Maverick Vinales, who already has a MotoGP win to his name. Outside the MotoGP paddock Marco Melandri returns to racing, partnering Chaz Davies at the factory Ducati squad in WSB. Hard-charging Italian Davide Giugliano moves to BSB onboard a BMW S1000RR in 2017. If nothing else he should be spectacular over the mountain at Cadwell Park. But with the return of Josh Brookes he'll have strong competition for King of the Mountain. Northern Ireland is the undisputed home of road racing, followed closely by the Isle of Man, home to the most famous road race in the world. But what about England? WE have Oliver's Mount, a narrow, hilly track perched on a hillside overlooking Scarborough and the North Sea. It attracts all the top road racers; Guy Martin, Michael and William Dunlop, Dean Harrison and John McGuinness have all battled around the tight 2.4 mile circuit, but it's always been a little hard to find decent coverage of the events. That all changes for 2017, as all four major race meetings at Oliver's Mount in 2017 will have their own highlights shows on ITV4. The Spring Cup kicks things off on April 22. After years of almost nothing but big, heavy, multi-cylinder adventure bikes, 2017 looks set to be the year small capacity adventure bikes make their mark and get taken seriously. Honda will be bringing us the Dakar-inspired CRF250 Rally, which looks stunning, and since it's based on the CRF250L will be incredibly easy to ride off road. Joined their compatriots is Kawasaki, with the slightly more road-focused Versys-X 300. Not one to be left out Suzuki also unveiled the parallel-twin V-Strom 250. But what about the kings of the adventure bike market, BMW? Don't worry, they've got the small adventure market covered with the upcoming G310GS. We've also spied a small capacity KTM or Husqvarna testing on the road and Yamaha unveiled an adventure bike concept based on the MT-07 at the Milan Show. At least we'll be able to pick these ones up when we drop them for the umpteenth time. You could be forgiven for expecting Triumph to be the British manufacturer that would build a production superbike, but they've been beaten by their noisy neighbours, Norton. The Norton V4 RR will be the British firm's assault on the superbike class, the result of everything they've learnt competing at the Isle of Man TT over recent years. Carbon fibre wheels, carbon fibre bodywork, but the Norton doesn't just look the part. Under the fairing is a 1200cc V4 pumping out north of 200bhp. Ohlins, Brembo and Bosch parts are also present. After taking a break from the TT in 2016 to compete in the Tour Divide cycling race, Guy Martin will return to the Isle of Man this year partnering John McGuinness at Honda. Despite hinting at his retirement last year the Lincolnshire truck mechanic says 2017 is the year he will focus on securing that elusive TT victory. Despite having never won a TT, Guy is one of the elite few to have recorded an average speed of 132mph, so we're excited to see what he can do when he really puts his mind to it. If you like your events to be a little whacky and left field then the DTRA Hooligan series will be right up your street. The class is open to multi-cylinder road bikes over 750cc which results in some rather odd machinery lining up on the dirt. Web Producer Liam Marsden raced a standard Harley-Davidson Street 750 during one of the events last year and although he lacks experience off-road had an excellent time and didn't finish last. The racers don't take it super seriously, so they're more likely to buy you a beer at the end of the meeting rather than bash elbows trying to get by. From a spectator's perspective it provides plenty of laughs and is always entertaining. When KTM purchased Husqvarna in 2013 we all wondered what the next batch of Husqvarna's would look like and Husqvarna didn't disappoint when they unveiled two super-stylish retro-futuristic concept bikes in 2014. The bikes, which will use the single-cylinder engine from the KTM 390 Duke, were unveiled in production form in November 2016, and they'll be going into production later this year. They're some of the most styligh production bikes we've ever seen, and we can't wait to see them on the road. In August 2016 Triumph and Guy Martin travelled to the world famous Bonneville Salt Flats, USA, to try and break the motorcycle land speed record. Armed with a 25ft streamliner pumping out 1000hbp from two turbocharged Rocket III engines, Guy recorded a fastest speed of 274.2mph, before a crash on one of his later runs ended all hopes of beating the record. Not ones to give up easily, Triumph will return again in 2017 with Guy at the helm, and they'll be hoping to hit 400mph. Fingers crossed. Motorcycle Live: What are you looking forward to? 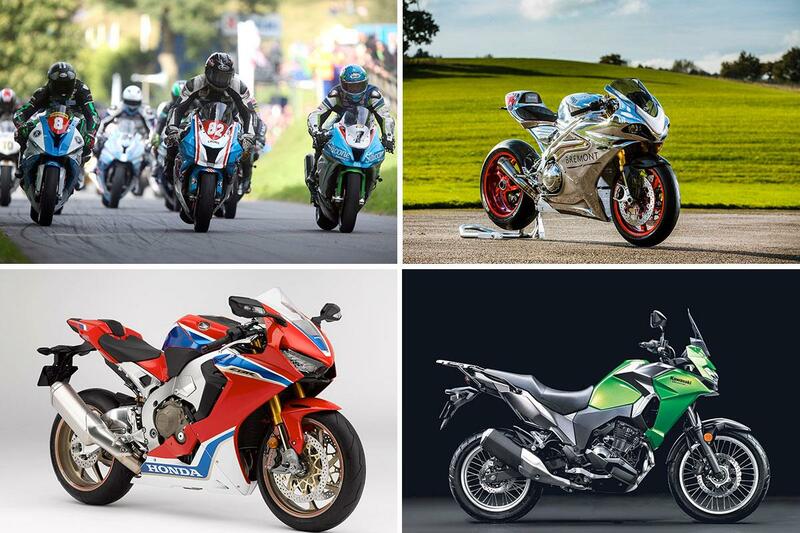 Poll: What bikes are you most looking forward to seeing at Motorcycle Live?